Political parties across Europe are benefitting from growing youth participation. But recent initiatives aim to go further: parties created for and by young people tackle the lack of representation felt by a whole generation. The past few months have witnessed a surge of interest and growing involvement from young people in European politics. The most recent elections in the UK and in France reflect this phenomenon particularly well. Indeed, defying all predictions, Jeremy Corbyn’s Labour performed extremely well in the snap election in June thanks, in great part, to the unusually high level of mobilisation from young British seduced by an effective campaign – and clearly angered by the Tories’ politics. Similarly, Emmanuel Macron’s victory in France last May followed his party En Marche!’s new mode of campaigning, which attracted high numbers of young voters. Of course, these victories resulted from multiple factors, national or not, but they have occasioned a lot of commentary on rising youth interest in politics. And indeed, the feeling of being ignored and falling victim to the choices of older generations – of politicians, but also of voters – have pushed more and more young Europeans to simply care more about politics. A most notable example, of course, was the Brexit referendum a year ago. But, since then, youth participation in protests, demonstrations as well as day-today democracy does not seem to have lost its momentum. As a New Statesman article on Corbyn’s new style politics recently asserted: “the young are the bearers and products of the new, they are the lightning conductors of change. Their elders, by contrast, are steeped in old ways of thinking and doing…” It is exactly with this in mind, that some young people have engaged in bridging the gap between the political establishment and a younger population, arguing that these should not be exclusive categories. Across Europe, in recent years and throughout history, political parties and movements for and from the youth have most often fed the ranks of extremists. This is notably the case of the Five Stars movement in Italy, which started as a movement to get rid of the old political elite, appealing to the Italian youth through comedian Beppe Grillo’s blog. In the past few years, progressive initiatives have shown that an engaged youth needs not be the preserve of populists and nationalists. However, in the past few years, progressive initiatives have shown that an engaged youth needs not be the preserve of populists and nationalists. On the contrary, giving voice to a generation that feels unrepresented and overlooked might be key to solving the growing discontent that fuels these extremes. E&M has spoken with two Europeans who have been involved in such projects: Ewout Hasken, 25, was deputy campaign coordinator for Niewe Amsterdamse Toekomst (NAT) in Amsterdam’s city council elections in 2014. And Mathilde de Bayser, 22, ran in the French legislative elections as a candidate for Allons Enfants (AE). 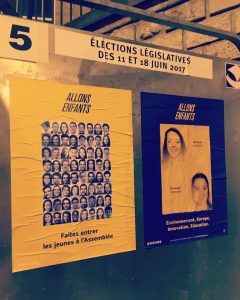 Both parties were created in 2014 by students who felt under-represented in their local institutions: Amsterdam’s city council for NAT, and Saint-Cloud’s (a suburb from Paris) for AE. Indeed, Ewout points to the growing feeling of a generational divide in the Netherlands following the abolition of a student grant in 2014. “Students and starters”, who felt they had “no job, no house, no more student grant” felt overlooked by traditional parties who had voted in favour of the grant abolition, in contrast with the over-representation of “baby-boomers getting all the attention.” Definitely not an issue faced by Dutch young people only! Similarly, Mathilde talks about AE’s goal of “giving the youth their voice back” and tell those who have lost interest that they can and should be represented. Another aim of AE is to stop the instrumentalisation of young people by traditional parties. While there are numerous youth movements attached to different parties, in reality the number of people under 25 in office is dramatically low. In the previous assembly, the only one was 22 – the name Marion Marechal-Le Pen might ring a bell: she is the niece of Marine Le Pen. Since the last French election, some (but still too little) progress has been made with two MPs under the age of 25. Of course, the aim is not to overthrow the political class as a whole, says Mathilde, but young representatives are indispensable to bring forward issues and themes specific to our generation. When asked if she identifies with any ‘traditional’ parties in France, Mathilde explains that, while her sensibilities align with the socialist party, it is the model of Macron’s En Marche that she finds best. Interestingly, when Ewout talks about NAT’s campaign, he mentions the success of their ‘get out the vote’ campaign of American inspiration (not unlike a certain En Marche strategy in the last French presidential election). But specific to these initiatives were their use of social media, and in particular their ability to tap into student networks – a strategy that seems to be progressively adopted by the mainstream parties as Corbyn’s campaign has shown in the UK. Mathilde compares AE’s project to a political start-up: everything, from digital production to treasury, was done by young people learning on the job. And at the heart of the projects is the participative aspect. During their campaign, NAP created their program along four themes around which they organised four debates and workshops open to anyone. Not only did this boost the number of adherents to the party, but it also allowed input from outsiders in the development of their program. Going even further, AE is making this systematic: on their website is a platform of “participative democracy” allowing anyone to contribute to their programme. Towards a significant change for the youth? Unsurprisingly, most of you won’t have heard of NAT or AE. And of course, these initiatives have remained marginal in the political landscape as we know it. Indeed, NAT disappeared after their failure to gain a seat in Amsterdam’s city council in 2014. And AE, which grew from their success in Saint Cloud, still remains very little known in France. But they are laying the ground for more. First of all, they show a conviction that things can be changed at the local level: it all starts in your city council, in your region. Moreover, elements of their ‘young’ style of politics are tactics we have seen adopted by numerous parties across Europe. This is not to say that these changes came from such initiatives, but it shows an evolution of political models – one that seems to grow more aligned with younger approaches. Finally, Mathilde explains that in the long run, AE is “destined to disappear”: their bet is that, in 10, 15, 20 years, AE would have become obsolete as young people would be naturally integrated in the political landscape. And indeed, if more initiatives like these spring up across Europe, why shouldn’t it be the case? This doesn’t mean that young people aren’t still tempted by the extreme ends of the political spectrum however. On the contrary, this was shown for instance with the success of the National Front and Unsubmissive France amongst young people in the French presidential elections. Nevertheless, this is only another proof that young people do not recognise themselves in traditional parties. Here is hoping that progressive initiatives such as NAT and Allons Enfants take off and help redefine the political landscape. And in the meantime, it is us young people who need to mobilise and make our voice heard to implement these changes. Western Sahara: Where does Europe stand?